Some flowering crabapple trees can have a pretty dense canopy. Spring Petals: If your crabapple tree is a heavy bloomer, the rain of petals in spring can create a dense, wet carpet that smothers fragile new grass shoots. The petals need to be raked up, but very gently, to keep from uprooting the grass. Fall fruits on a crabapple tree. Fall Fruits: If your tree produces lots of crabapples, the fall fruit drop can be equally as damaging to the grass underneath. They also need to be gently raked up in the fall. Nutrient Competition: Even though crabapples don’t have particularly aggressive roots, all trees compete with lawn grasses for nutrients, and sometimes the lawn loses out. Try planting a tough, shade tolerant, and low-fertility lawn grass, such as creeping red fescue, that might not be as vulnerable to competition. Blocked Light and Water: If the tree is densely branched, it can block sunlight and rain necessary for grass to grow. Thinning the tree can help let in more light and water, and you may want to supplement irrigation under the tree as well. 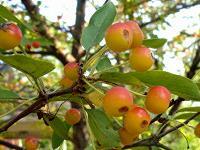 Acidic Soil: Crabapples prefer slightly acidic soil, so if your tree is really happy, chances are the soil underneath is naturally more acidic. Do a soil test to make sure, then look for lawn grasses compatible with your soil type. If grass just won’t grow under your crabapple, consider digging up the area and creating an annual or perennial flower bed. Perennials in particular will be less vulnerable to falling petals and fruit underneath your tree.